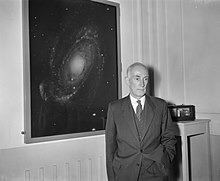 Jan Hendrik Oort FRS  (28 April 1900 – 5 November 1992) was a Dutch astronomer. Oort made significant contributions to understanding the Milky Way, and was a pioneer in the field of radio astronomy. His New York Times obituary called him “one of the century's foremost explorers of the universe”. The European Space Agency website describes him as, “one of the greatest astronomers of the 20th century”, and says he “revolutionised astronomy through his ground-breaking discoveries”. In 1955, Oort’s name appeared in Life Magazine’s list of the 100 most famous living people. He has been described as “putting the Netherlands in the forefront of postwar astronomy”. Oort proved that the Milky Way rotates. Finding that the visible mass was not enough to explain the rotation, he suggested the existence of invisible dark matter, in 1932. This is now thought to make up aboout 84.5% of the total matter in the Universe. Its gravitational pull causes “the clustering of stars into galaxies and galaxies into connecting strings of galaxies”. The Solar System's Oort cloud is named after him. ↑ Van De Hulst H.C. 1994.. "Jan Hendrik Oort. 28 April 1900-5 November 1992". Biographical Memoirs of Fellows of the Royal Society 40: 320–326. doi:10.1098/rsbm.1994.0042. ↑ Woltjer, Lodewijk 1993.. "Obituary: Jan H. Oort". Physics Today 46 (11): 104–105. doi:10.1063/1.2809110. http://www.physicstoday.org/resource/1/phtoad/v46/i11/p104_s1?bypassSSO=1. ↑ 4.0 4.1 4.2 Wilford, John (12 November 1992). "Jan H. Oort, Dutch astronomer in forefront of field, dies at 92". New York Times. Retrieved 30 May 2014. ↑ "Jan Hendrik Oort: Comet Pioneer". European Space Agency. Retrieved 30 May 2014.